With Labor Day this coming weekend and cooler weather hopefully right around the corner, we’ve only got a few more weeks of true summertime. Last week I received a lovely care package from Piperlime with lots of end of summer goodies including this show-stopping sequin skirt. It’s definitely my favorite piece of the bunch, no question. The fun tribal print and unique color combo are just right for summer nights out. 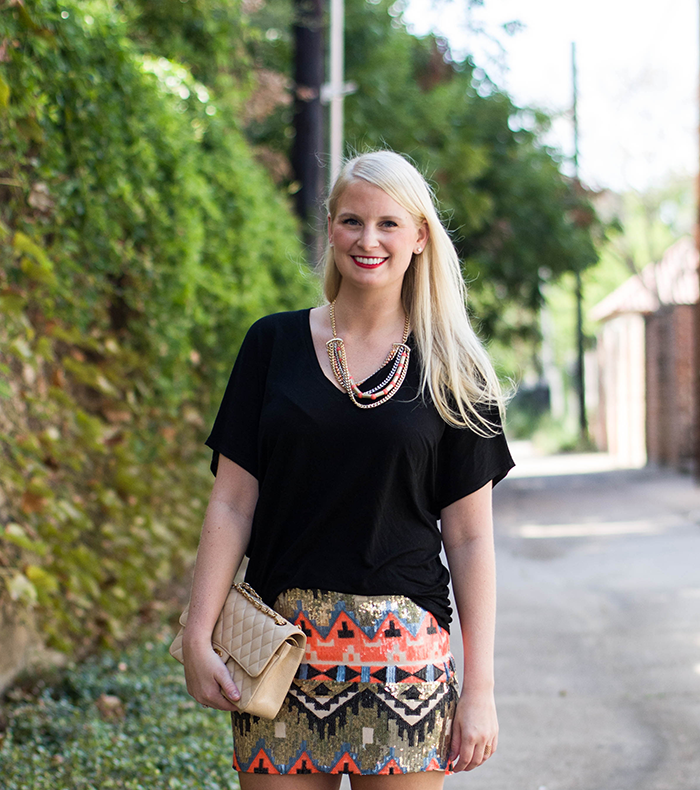 One of my favorite ways to wear sparkly pieces is to dress them down – here I’ve done this with my favorite Pickwick Weller tee (same style here). It offsets the sequins just enough to take the “Vegas” feel down a notch. I can’t wait to style it in some other ways – perhaps an oversized sweater and boots to transition for fall? That skirt is so pretty, love all the sparkle. This mini is gorgeous and I love how the colors in your necklace echo the print of the skirt…so pretty! What a fun skirt & love the heat wave on you! It’s one of my favorite Summer shades! I love this skirt and your tips for dressing it down. I have several pieces that are similar that I am always too afraid to wear for just any occasion, but the way you have styled this makes it so versatile. That skirt is definitely on my wish list now :) Happy Monday! I saw this skirt on your Instagram this morning and I absolutely fell in love! 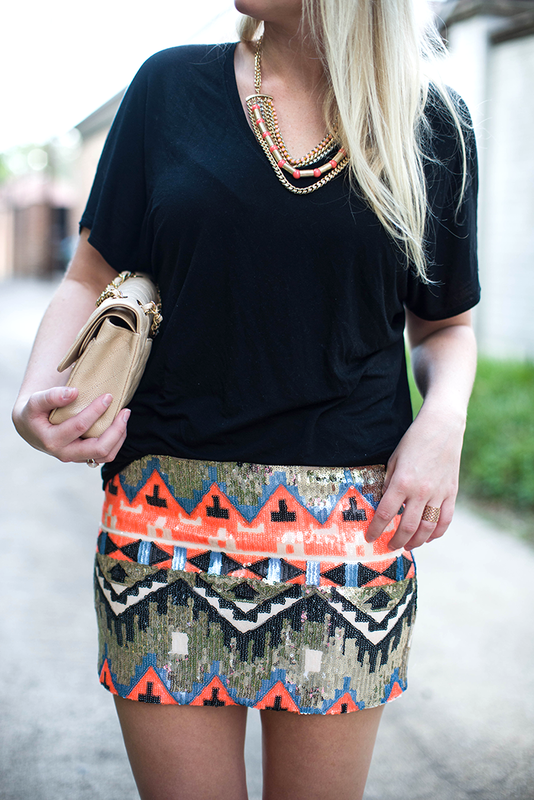 I adore the mix of tribal detail with sequins – amazing find. Looks great on ya too. 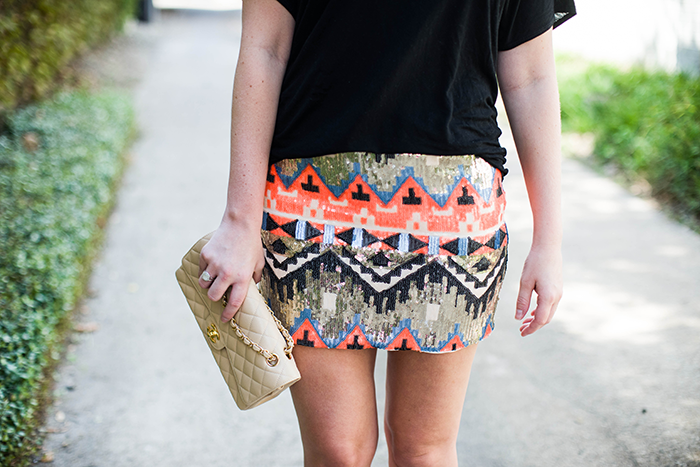 LOVE this skirt on you– so so cute and in the best colors. xo. So cute Merritt! I love that skirt! 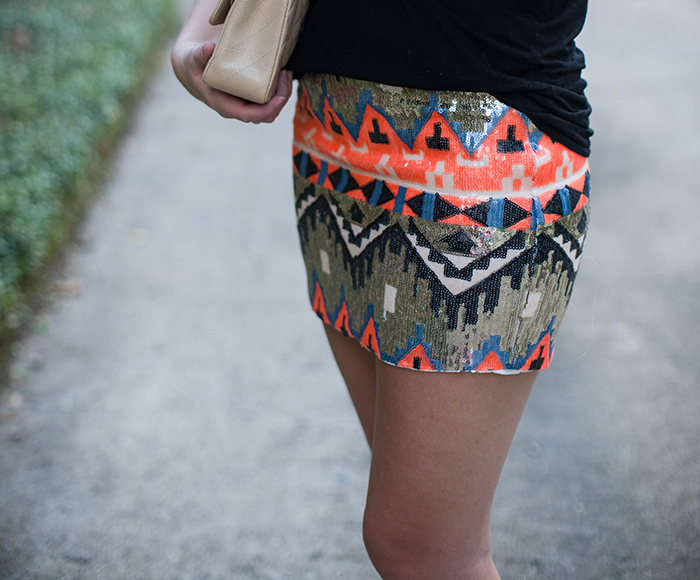 this skirt is beyond perfect. I’m obsessed. Looks amazing on you! Such a beautiful outfit! That skirt is stunning and it goes well with the necklace. That skirt is a great piece! I can’t wait to it reworked in the fall and winter. The necklace matches so perfectly!! !